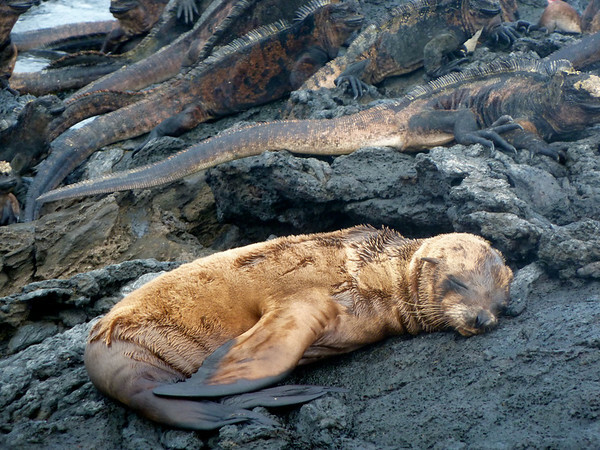 We start the morning hiking across Santiago Island to lava flows teeming with Galapagos Sea Lions. 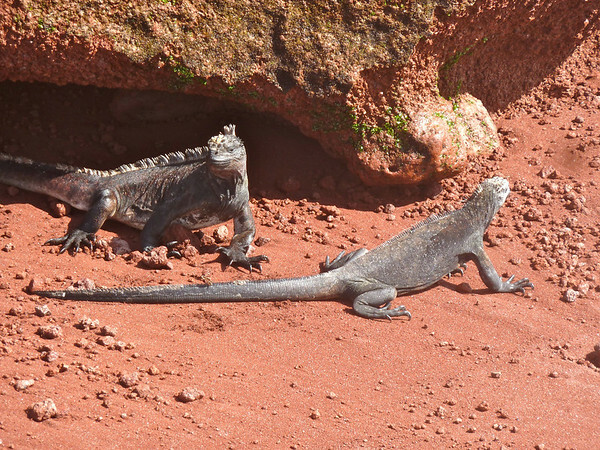 There are not as many Marine Iguanas as the last two days but they are generally larger. 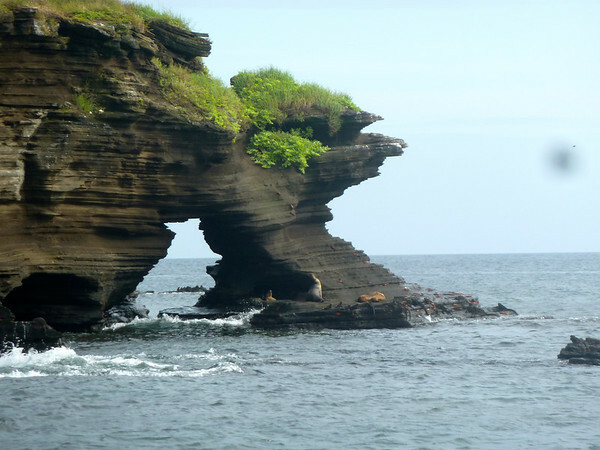 Some incredible pools and bridges over the ocean formed by the lava flows add texture to an already beautiful scene. 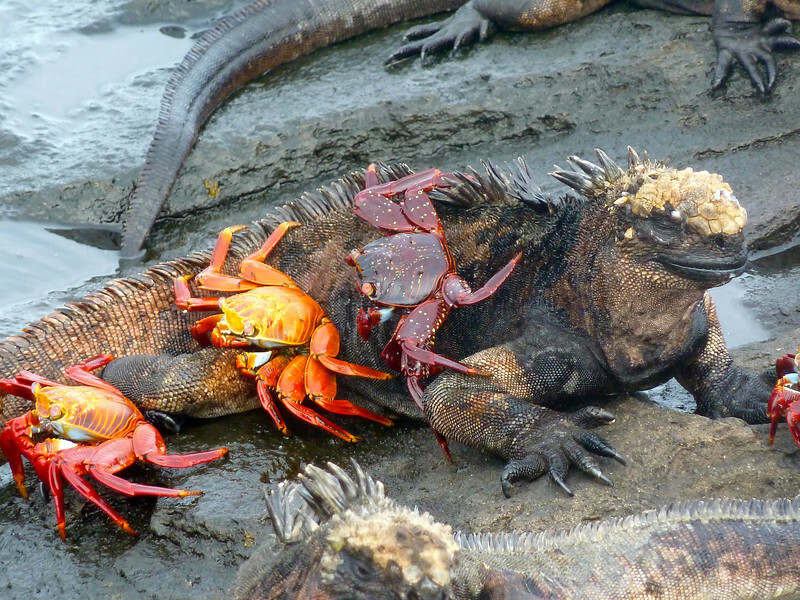 Sally Crabs are climbing on the sea lions and Marine Iguanas. They clean off the dead skin and the animals don’t seem to mind in the least. Then it is time for another stellar snorkel. I keep saying this is the best one yet and today this is true as well. 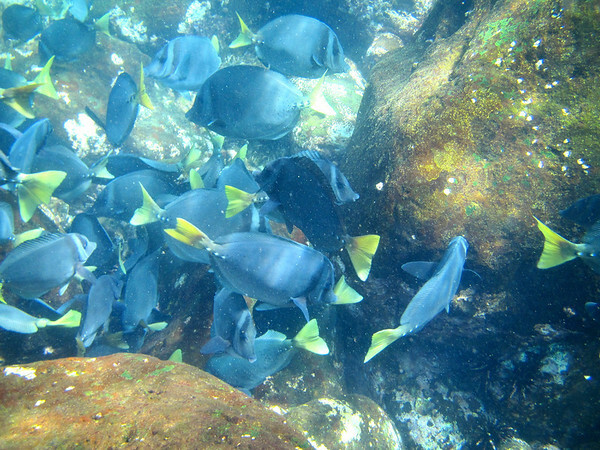 I see some fish I have never seen before. Also some purple coral that was quite beautiful. But the kicker are several sea lions swimming in the ocean with and around us. They are playful and put on quite a show for us. It is truly an amazing and magical experience. We reboard about 11 a.m. and pull up anchor. 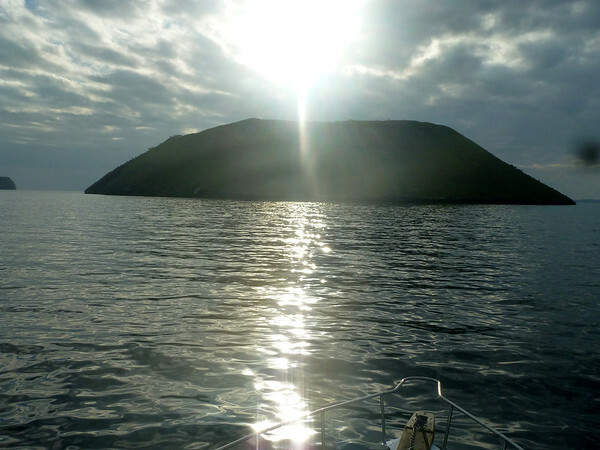 During and after lunch we navigate to Rabida Island. 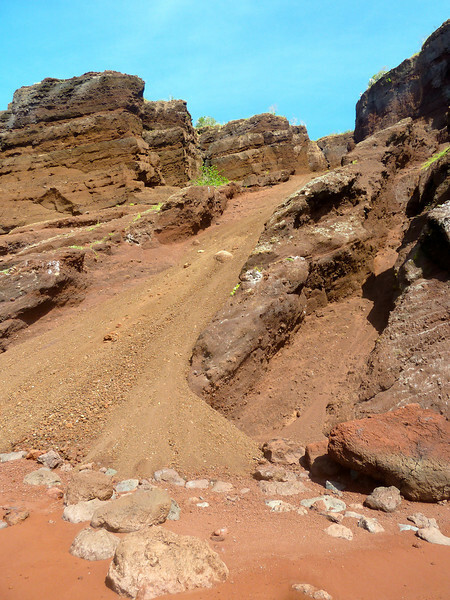 The island is red, caused by volcanic ash rather than basalt. We hike to the top and over. The scenery is stunning with the turquoise water, green plants and Marine Iguanas popping with color against the red background. 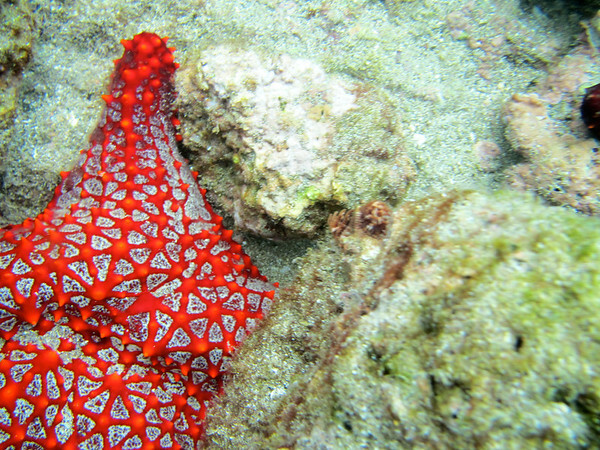 Afterward, one last snorkel, sigh. No mammals this time but plenty of fish and a couple skinny rays. A nice windup to the week. After breakfast we do a Zodiac trip around the island. 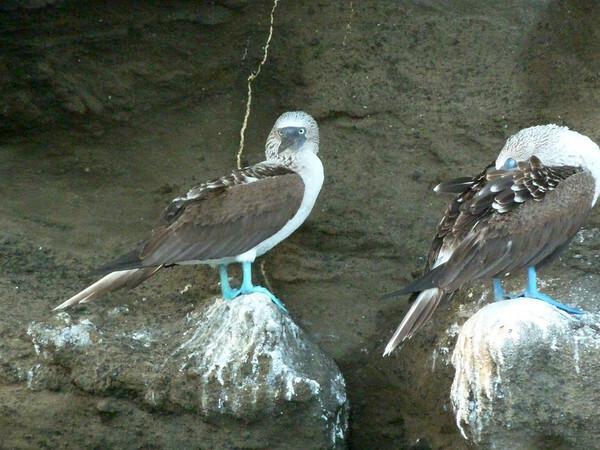 I get some good shots of Blue Footed Boobies and some good shots of birds in flight. Then it’s back to the boat, back to Basra and goodbyes all around. Guy, Jackson and I head to San Cristobal Island for a couple days. 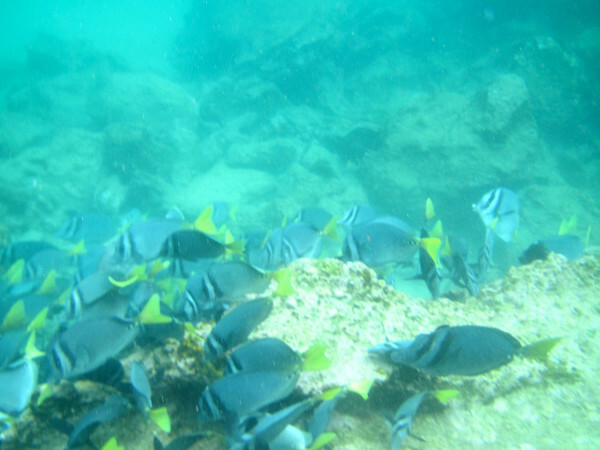 We will snorkel again tomorrow off Kicker Rock here. Stunning! What an amazing experience, Philip. The sea otters are so adorable! I know, especially the pups. Sometimes I just wanted to hug one, but that would be inappropriate. Even though they have no fear of humans, one is asked not to touch the wildlife. I did stroke a sea turtles back however when it swam up next to me. Probably couldn’t feel my hand through its shell but it was good for me, ha ha. 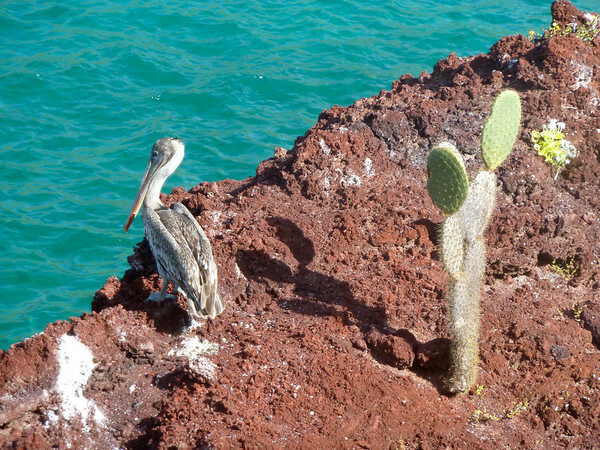 Wow–best photos I’ve seen of the Galapagos! Love the iguana. Thanks NLM; good to hear from you again. Enjoyed the post about your dad’s marathon.